WASHINGTON, D.C — Wednesday could have been the last game of James Robinson’s career. The senior point guard and his Panthers needed a win, sitting on the bubble for the NCAA Tournament field of 64 and Pitt’s accepting an NIT invitation no guarantee. And with Pitt on the ropes, he did what he did against Villanova his freshman year. And Virginia Tech his sophomore year. And Notre Dame his junior year. And Wake Forest this year. He willed the Panthers to a victory. Robinson — with some help from Cameron Johnson — was crucial late in weathering a late Syracuse comeback, as Pitt topped the Orange 72-71 at the Verizon Center in the second round of the ACC Tournament Wednesday. With the clock winding down, a Michael Gbinije dunk capped off a 14-2 run for Syracuse, who once trailed 66-54 with just four minutes remaining, tied Pitt at 68 with 1:58 remaining. And following a missed three by Cameron Johnson, the Orange had numbers going on the fast break. That’s when Robinson leapt in front of a Frank Howard pass, snared the ball, drove, spun and laid it in, giving Pitt a 70-68 advantage with 1:04 left. He would follow that up with a floater with :22 seconds remaining. A three-pointer by Gbinije and a missed free throw by Sheldon Jeter on the front end of a one-and-one upped the suspense. But after making a move to create separation, Syracuse senior Trevor Cooney missed a 3-pointer as time expired, finishing off the Orange. Robinson’s big play loomed, proving to be the difference. Robinson was clutch in the waning minutes, but for the better part of the game, two Pittsburgh natives led the Panthers while coming off the bench. Sophomore Ryan Luther of Gibsonia, Pennsylvania, was crucial in the paint for the Panthers, tallying 13 points, five rebounds and two steals. And redshirt freshman Cameron Johnson of Moon Township, Pennsylvania, was even bigger, leading Pitt with a career-high 24 points on four threes. Jeter said the team has unwavering confidence in Johnson, who missed Pitt’s regular season finale against Georgia Tech with an arm injury. Michael Young said his team has confidence in each player on the roster, while noting that his confidence in Johnson dates back to when the two played against each other locally in high school. The game was also played under unusual circumstances, as technical difficulties with one of the shot clocks led to both being shut off in lieu of clocks placed on the floor in opposite corners of the court. Young said this was the first time he’s encountered this type of situation since playing AAU. 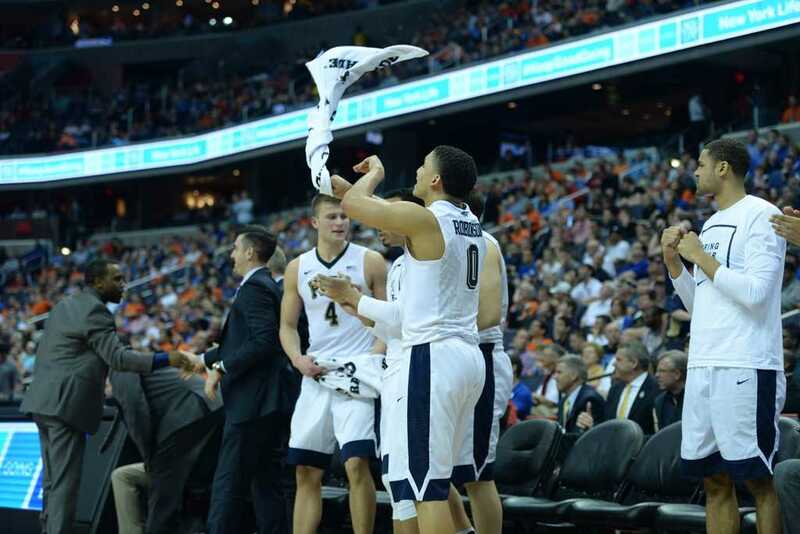 The environment was incredibly adverse to Pitt in those final six seconds following Jeter’s missed free throw. It was an eerily similar end to the teams’ matchup in Feb. 2014, when point guard Tyler Ennis made a 35-foot jumper as time expired to lift an undefeated Syracuse team over Pitt at the Petersen Events Center. Robinson sheepishly grinned when asked about whether he had some flashbacks to that game. Jeter expressed just how much relief he felt once Cooney’s shot bounced off the rim. In the end, Robinson’s heroics bailed out the junior forward. Jeter hopes that Robinson’s clutch play hushed some doubters. Pitt will face the ACC regular season champion North Carolina Tar Heels tomorrow in Washington D.C. Tip-off is at noon.